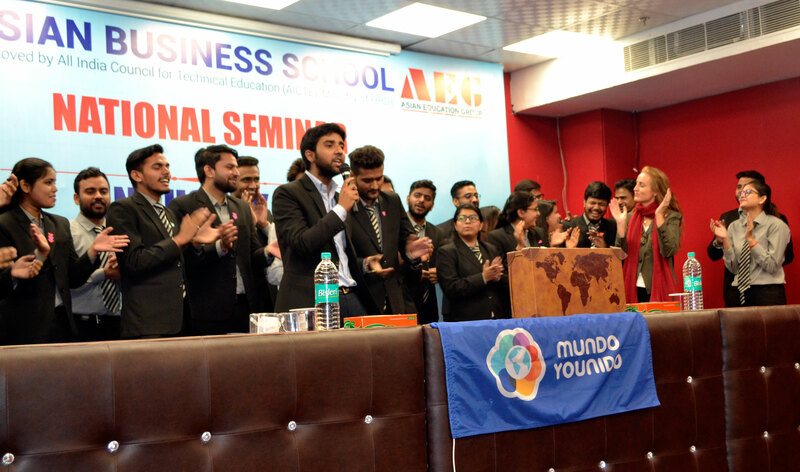 On 19th November 2018, students of Asian Business School got the opportunity to witness the HAPPINESS drive through Mundo YOUNIDO conducted by the founder of the organization Ms. Patricia Haveman. Mundo YOUNIDO is a worldwide movement of change makers, who can be called the world citizens or Mundians. Their motive of the organization is to make a better world for each other, spread respect, love, peace, hope and happiness for everyone. Ms. Patricia Haveman told the students about how we people can start initiating by doing individual efforts to spread love and happiness as they believe that together people will be able to solve global problems from the source: Humans itself, and together people will be able to raise the quality of life and happiness quotient of others. Ms. Patricia has dedicated her life to the mission of making a united world for each other. She inspires and activates people worldwide to respect each other and our planet. She wants to spread respect, love, peace and happiness to inspire and connect people. Inviting thestudentsto speak about what peace is according to them and students spoke their heart out. Makingstudentsvolunteer and make a song about peace and sing it at the end of the session. Distribution of the stickers of heart to thestudentswhich symbolized love and peace and it turned out to be a source of joy and happiness amongst students. Studentswere asked to write down their three wishes that they believe will be fulfilled and will spread joy and peace among the people. Studentsexpressed their hardships and challenges they faced and how they overcame it. Overall, it was an enriching experience for ABS students which motivated them towards becoming better human beings and contribute in making this world a better place.